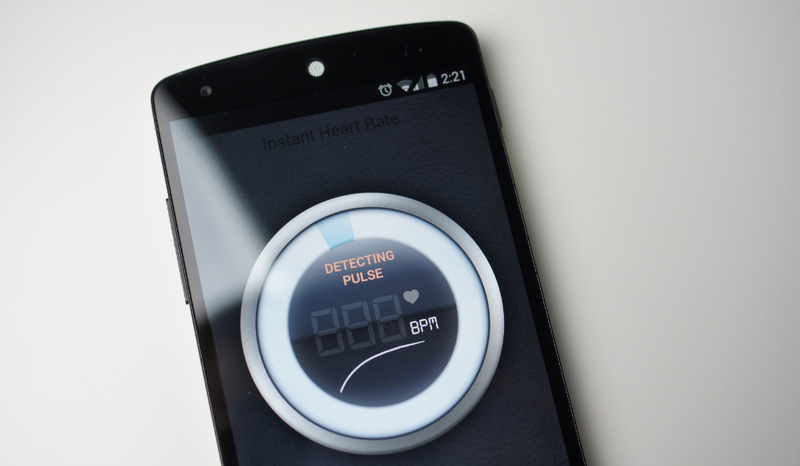 Think the Galaxy S5’s Heart Rate Monitor is Sweet? Your Phone can do it too! Last week in Barcelona and New York City, Samsung unveiled the Galaxy S5, the world’s first smartphone to feature a dedicated heart rate monitor built into the device. While few people were claiming this to be the best thing since sliced bread, we had a few people take to our comments section, claiming they’ve had this on their phones since the Gingerbread days. At first we were skeptical, but once I made my way over to Google Play, I was blown away by just how many heart rate monitor apps there actually are. The app we downloaded and used for this post is called Instant Heart Rate. The app is pretty basic – it lights up the LED flash on the backside of your phone, then you place your finger over the camera’s sensor. The sensor counts the changes in the tip of your finger (the blood flowing in and then out of the tip), then calculates your overall beats per minute. It usually counts for about 15-30 seconds, then does the simple multiplication for you. Apparently, apps have been doing this for years, way before Samsung announced the Galaxy S5. Should you use this app’s results in your personal medical evaluations? Heck no. Should you trust the Galaxy S5’s more so just because it’s built-in? Heck no. These features in general, whether built-in or not, won’t give you a 100% accurate reading. If you need the best results without the use of a smartphone, it’s actually quite easy to take your own pulse through your wrist or neck. Simply count the beats for 30 seconds, multiply by two, and you’re done. Below you can watch a video which gives you a general idea as to how the app functions. Again, there are a ton of other heart rate apps on Google Play, so give it a search if this once doesn’t work for you.